Proprietary Name: Lights Povindone Iodine Swabstick What is the Proprietary Name? Non-Proprietary Name: Povidone-iodine What is the Non-Proprietary Name? 61333 - Lights Medical Manufacture Co., Ltd. 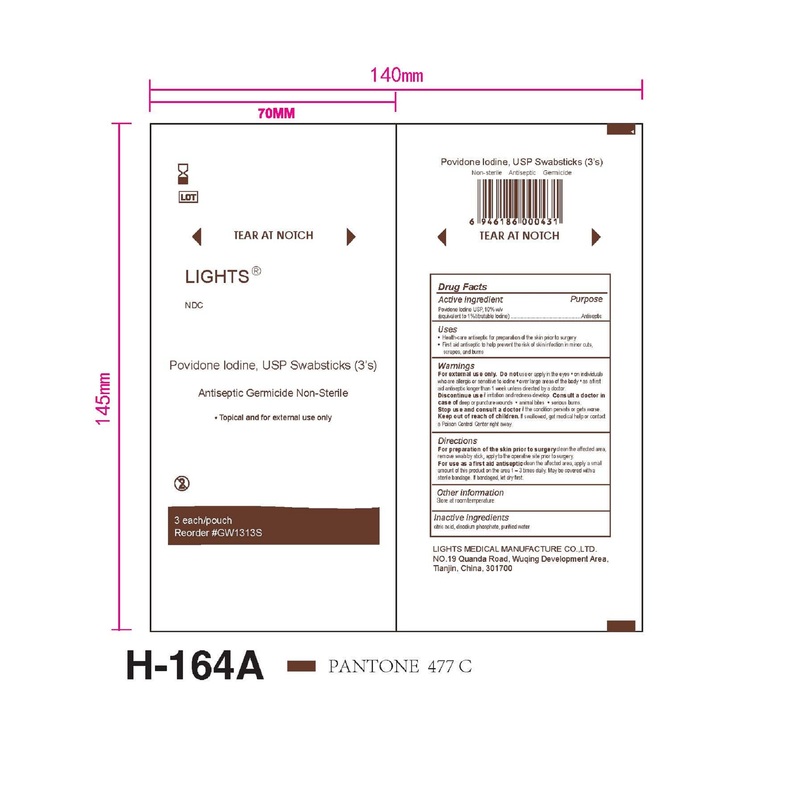 Lights Povindone Iodine Swabstick with NDC 61333-204 is a a human over the counter drug product labeled by Lights Medical Manufacture Co., Ltd.. The generic name of Lights Povindone Iodine Swabstick is povidone-iodine. The product's dosage form is solution and is administered via topical form. Labeler Name: Lights Medical Manufacture Co., Ltd.
Use:Health care antiseptic for prepapration of skin prior to surgery.First aid antiseptic to help prevent infection in minor cuts, scrapes and burns. For preparation of the skin prior surgery: clean the affacted area, remove swabstick, apply to the operative site prior to surgeryFor use as first aid antiseptic: clean the affacted area, apply a small anount of the product to the area 1-3 times daily. Maybe covered with a sterile bandage. If bandaged, let dry first.